This film is way too inventive, and the creative weirdness reaches such genius levels of WTF-ery that it's much more likely everyone knew exactly what they were doing. 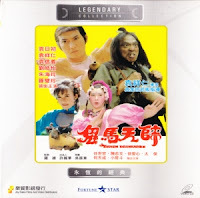 When I first got this movie, my copy had no English subtitles (Media Asia VCD MS/VCD/323/HK). 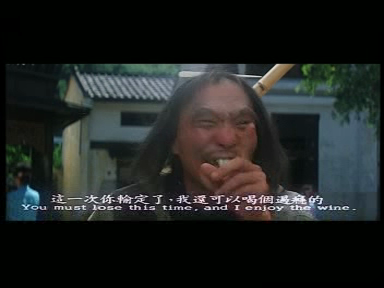 This happens occasionally with Hong Kong VCDs. I watched it anyway, and the lack of subtitles didn't seem to matter at all. 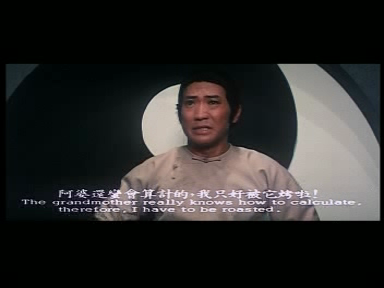 I bought the Fortune Star version of the film with subtitles included, just to be sure. I was right. The subtitles made no difference. Here's why. 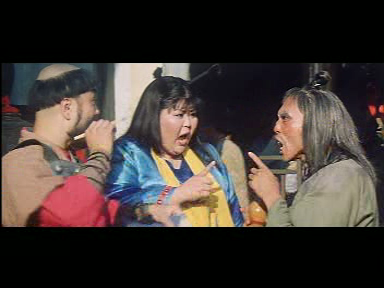 There is an old lady, who's kung fu style involves smoking a giant pipe as a weapon. There's a scene where an evil boss attacks a monastery with tiny helicopters which explode, turning their victim's heads into pig heads for no apparent reason. There are subtitles in both of these scenes. Do they help the scenes make sense at all? No they don't. You see, sometimes it's possible to watch a film without subtitles because the movie is clear and linear, and it's easy to follow the plot without them. But sometimes a movie makes absolutely no sense at all, so that even with prefect translations it's impossible to follow. Taoism Drunkard is that second kind of movie. This is a vehicle in the world of this film! 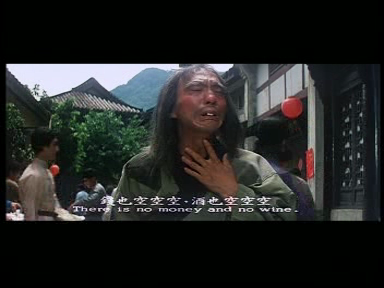 "There is no money and no wine." OK, character motivation is clear. "You must lose this time, and I enjoy the wine." 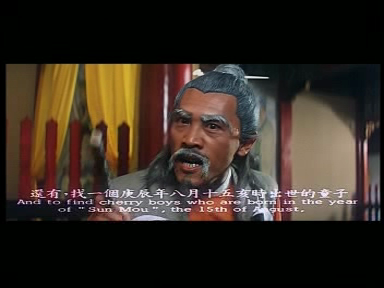 "And to find cherry boys who are born in the year of 'Sun Mou', the 15th of August." Really? 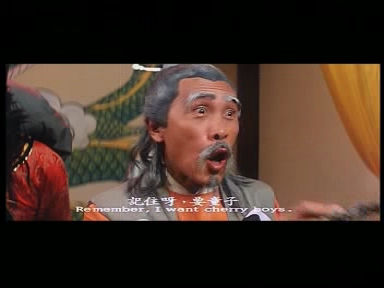 "Cherry boys"? Are you sure Mr. priest? "Remember, I want cherry boys." Ech! 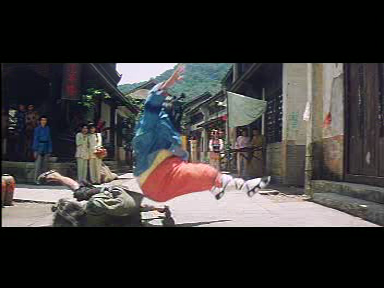 Good thing Yuen Chung Yan drops this whole "plot" thing almost immediately, and spends the rest of the movie jumping from one hilarious, surreal fight scene to another. 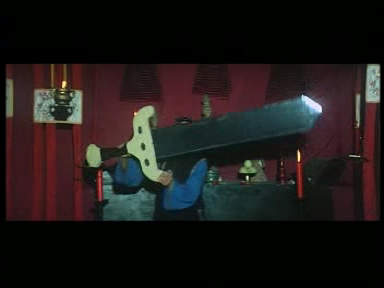 This old lady's sword turns out to be way too... unwieldy... to be practical. Consider this random fight: One of the guys has a kung fu style based on extra sharp knees and elbows and porcupine quills stuck to his back. 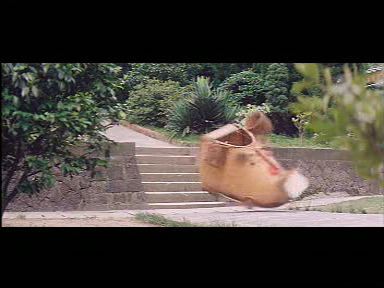 His opponent fights with a weapon that appears to be a cross between a boomerang and a bowling ball, which can launch miniature versions of itself. The only thing that stays constant is the utter randomness, and the playful freedom of the director. In one of my favorite scenes, a guy wakes up to a fresh dawn. A rooster crows while he smiles and stretches. He goes to the door to greet the new day. But wait! What's that black spot in the sky? No, it's an evil kung fu villain of course! He's randomly flying through the sky at this precise moment (how did he know exactly when the guy would wake up?) and now suddenly attacking him for no reason at all and breaking all his furniture. W. T. F! From the Gweilo's perspective, this kind of crazy, swaggering, carefree movie making is amazingly refreshing compared to Hollywood's timid formulas. Who the hell makes movies this way? Who the hell would even dare? Yuen Chung Yan, that's who! I'll dress like a bee if I want! 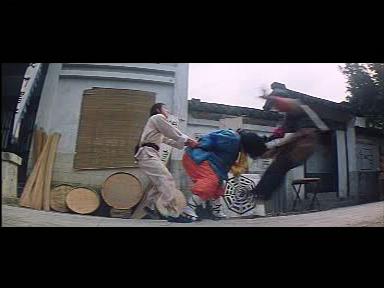 And there's fight scenes that transition smoothly from intentional dancing-style kung fu to accidental frying-eggs-style kung fu. Accidental frying-eggs-style kung fu?! Yes indeed! And, and, and... OK, I'm getting too excited here. I've already thrown in way more clips and stills than usual, and I feel like I'm just getting started. So I won't even go into the characters that suddenly turn into other characters in weird Scooby-Do revelation scenes. Or the scenes where the characters fight themselves, in a warehouse full of badly made dummies of themselves. No. The problem is, Taoism Drunkard simply cannot be explained without showing you every clip from the movie and outlining every scene. And even if I did that, you'd still have no idea, no idea at all, of the non-stop delightful mind game this movie is. Bottom Line of this Chinese Movie Review: See it! This movie is... it sure is... something. There are not a whole lot like it!